I'm with you on the Home Depot thing! btw ... 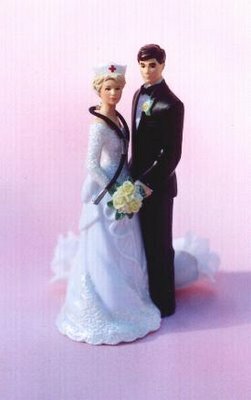 I love the nurse wedding cake topper! I love your wit! You made me laugh inside. I am soo for the Home Depot Approach! But then, I have never been married, myself! And I have only been to a couple of weedings. Hey, I say take the wedding money and travel the world, or simply feed it! thing is, as time goes on, the wedding gets more important than the marriage. sad. 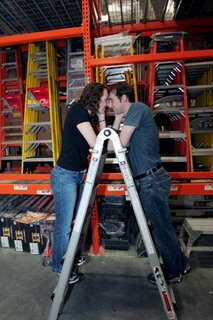 I did see a Home Depot gift card on a bridal registry once -- just kidding. Funny post. Nice job! The reception was in a club in the middle of Edinburgh. I wore my tuxedo. They didn't manage to get me into a kilt. I did lots of dancing that night. My bowtie ended up on the floor - it was a good night! Lea: Thank you for the compliment. It's high praise coming from a writer like you. Andrew: Thanks for dropping by. Do your readers come to you for advice about ways of planning a stress free wedding? Elena: Thanks for your kind words, and drop by again. Decon Barry: No kilt? Sounds like you had fun. I did have a pair of trousers on. I have worn a kilt in the dim and distant past, but at present I do not possess one. When I do, I will, of course wear it with its traditional accoutrements: sporran, hiking boots and Heavy Metal T-shirt. If you think I'm joking, come to Edinburgh in the summer. If you wear that, walking along Princes Street, no-one will pay any attention to you. I've never been out of the US, and I've always dreamed of taking a trip to the UK. Edinburgh sounds like fun. I'll bring the Heavy Metal T-shirt if you wear the kilt.